Fresher vegetables than you can buy anywhere else. Lots of color and flavor without the work of growing it yourself. We don’t use any pesticides, not even ones that are allowed on organic farms. Vegetables grown locally rather than shipped across the country or internationally. Almost no packaging to discard. Homemade wooden crates are used and returned. It is much easier to eat healthier all season long. Built in flexibility with our weekly swap box and market credit for each week you skip. 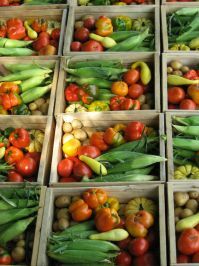 Wood’s Edge Farm Stand from 4-6pm Mondays at the corner of Hwy 42 and Cromer Rd, 2 miles north of H’burg. Friendly City Food Coop from 4-8:30pm Wednesdays in downtown Harrisonburg, right next to the post office. Submit your full payment when you sign up, or pay $100 when you sign up to reserve your subscription, and the rest due by February 1st. If you need to be gone or want to skip a week or two or more, just let us know on our website (“vacation holds” tab under the “CSA Subscriptions” menu) by the end of the day of the prior Saturday. We will give you a credit to use at our stand at the Harrisonburg Farmers Market that will be good through Thanksgiving. ($15 for ½ subscriptions and $23 for full). We keep a list of credits with us at market, so simply stop by the market any Saturday morning, and let us know you want to use your credit. The credit can be used on anything we sell at market including flowers and meat. To increase flexibility, we have weekly swap/donation boxes at both pickup locations. When you swing by to pick up your subscription, you are welcome to swap an item from your crate for something of similar value from the swap/donation box. And if there is an item you simply don’t want, you are welcome to donate it to the box. These items, as well as any subscriptions not picked up, are usually donated to a food charity like the OCP Soup Kitchen or Patchwork Pantry. As always, the weekly crates of vegetables will be made up of whatever is currently in season. The amount will likely be smaller for a couple weeks at the beginning and end of the season. At the start, there is usually an abundance of fresh greens, until the main crops come into production with the heat of summer. At the end of the season there are usually lots of vegetables that can be set aside for winter such as butternut squash, potatoes, onions, sweet potatoes, and garlic. Overall, in keeping with the "Bounty" in our name, we strive to give you more than you paid for, so that you get your money's worth even if you aren't able to use every last item. We plant about 70 total varieties of approximately 30 types of produce. Of course depending on the weather, some years we harvest more of certain varieties than others. We occasionally include an item from another farm such as sweet corn from Dry River Produce. Please note that while we don’t use any pesticides on any of the produce we grow, items from other farms don’t carry the same pesticide-free promise. You are always welcome to stop by the farm to see how your vegetables are growing, or to get your hands in the dirt. Let us know if you have any questions. We look forward to sharing the season’s bounty!